More US Netflix subscribers are cutting their pay TV cords than ever before, according to new research. Just 67% of 829 respondents surveyed by CutCableToday said they still had a pay TV subscription, with 9% saying they planned to cancel their service next year and a further 16% currently unsure if they would have pay TV a year from now. 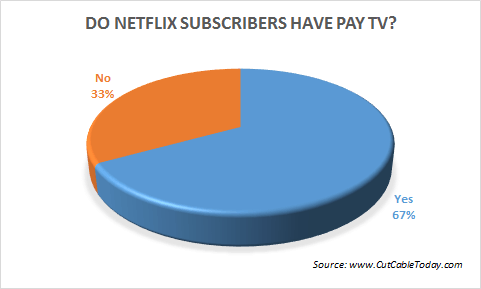 CutCableToday employed an independent company to survey random Netflix subscribers, and the site claimed the findings were evidence those remaining with pay TV services would “steadily decline moving forward”. The research showed the best weapon pay TV services have against cord-cutting was service bundling, with 39% of respondents saying they took internet, TV and phone services together. CutCableToday said cancelling bundles were “notoriously difficult to break, penalising cord cutters with higher internet prices when they cancel their pay TV”. Ninety-two per cent of respondents said they were satisfied with their Netflix service, while Amazon Prime Instant Video proved the most popular complementary streaming service among Netflix subscribers. Some 47% said they used Amazon alongside Netflix, with 30% using HBO Now, 27% using Hulu Plus and 5% using Sling TV. Quality content, price, on-demand availability and simplicity were found to be the four key features for Netflix users.